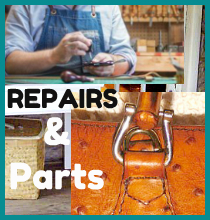 In response to requests for Repairs and Replacement of Parts specific to Dooney & Bourke handbags, we now offer a few of these most requested. Order this service for the repair of the Bamboo Handle Loop pin. The Nickel plated Brass Loop which attaches the Bamboo Handles on Dooney Bags in the Panama Collection & Bayou Collection is subject to the loss of the attachment pin for this metal Loop piece. We will reattach your Bamboo handle to your bag by replacing the missing pin or pin(s). Should I purchase additional insurance in case my bag gets lost in the mail? Maybe, it's up to you. Your bag is "insured" 2 ways when ordering our Repair Service: All payments go through Paypal on our end and they will refund you the entire price you pay for this service if you never receive your bag back or we don't receive your bag when you ship it to us. Additionally, the US Post Office automatically insures your package for $50. If you should decide to order additional insurance to cover the full price of your bag in the event it is lost or damaged when we return it in the mail after completing the repair, please email us with your request (we will then send you an invoice to pay for the additional insurance and once you have paid this- we will ship your repaired item back to you Insured.) Vintage Dooney is not responsible for your bag while it is in the hands of the Postal Service. While, to date, we've never experienced the loss of a bag in shipment, there is always that possibility.